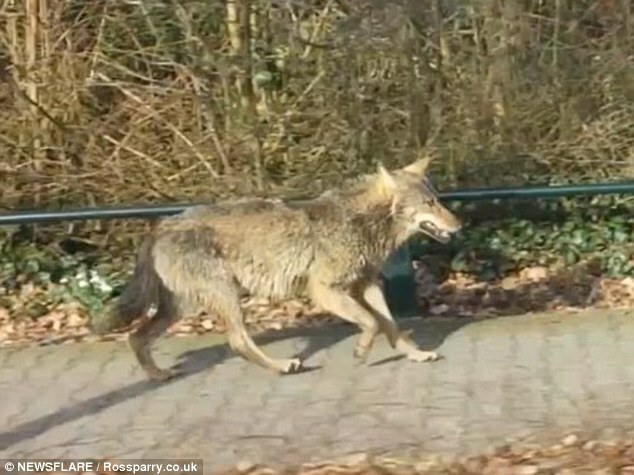 Wolves appear now to be established back in the Netherlands with settled females and a regularly visiting male form Germany now likely to form its first pack in well over a century. 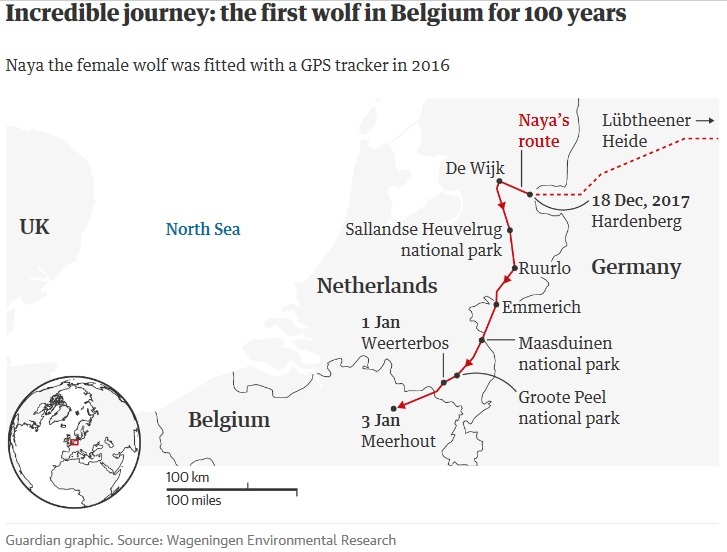 The occasional visits of wolves from Germany to the Netherlands have been reported over recent years, including one trekking into Belgium. What has now changed in the Veluwe region of the Netherlands is that females are now familiar with the landscape and the natural dynamic of meeting a migrant male will enable a pack to develop and become established. 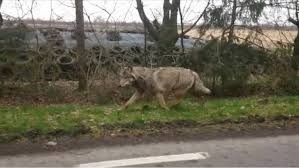 Farmer are having to adapt methods for protecting flocks including new fencing, new shepherding and use of dogs, particularly in France which has nearly 500 wolves. This entry was posted in Conservation on April 9, 2019 by Simon Black. There are perhaps as few as 20,000 lions left in the wild. When I first started studying lions just over a decade ago we thought there were 40,000. Will this figure halve again over the coming 10 years? For a sobering comparison, when I was a child there were 40,000 tigers in the wild; now only around 4,000. The similarity in the lion figures is startling. Decline is real and fearsome. A comprehensive set of studies of lion genetics has recommended the IUCN to consider the lion family tree as two subspecies. One is the North/West /Central subspecies, Panthera leo leo (which includes lions in West and Central Africa and India, and the previous, now extinct populations in the Middle East, and of course the extinct Barbary lion of North Africa). The second is Panthera leo melanochaita from South and East Africa (i.e. about 90% the world’s population). All remaining ‘northern’ lion populations are tiny and very vulnerable. The ‘southern’ populations are much larger but many animals are cut off from each other in fenced reserves or fragmented landscapes. Zoos may have a significant part to play in managing, sustaining and recovering the ‘northern’ subspecies Panthera leo leo. There are around 100 Asiatic (Indian) lions in captivity, but I do not know of a single captive lion from West or Central Africa in any zoo, even in their home countries on the African continent. 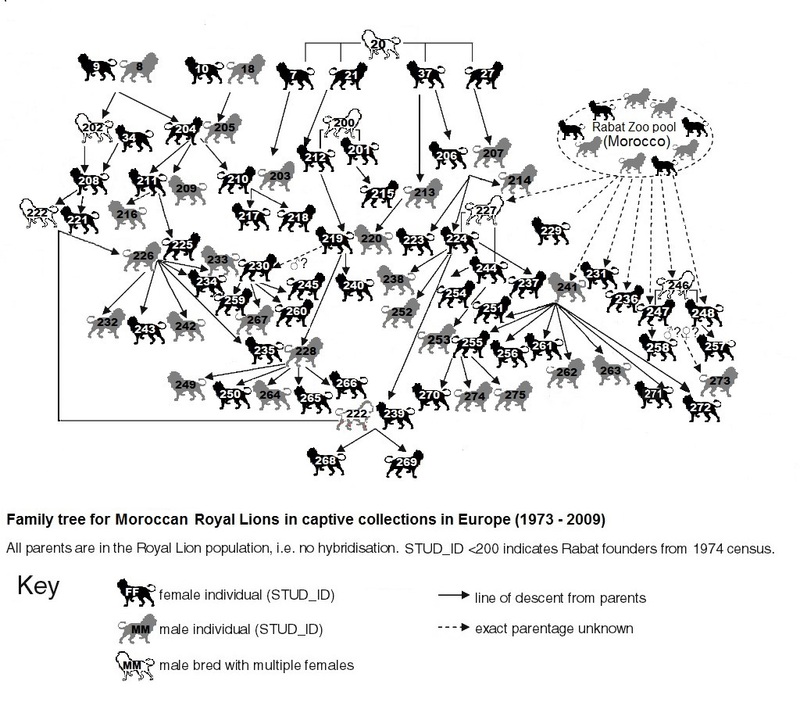 There are a further 80 captive lions which may be related to the extinct North African Barbary lion. maybe the captive Addis Ababa lions in Ethiopia are linked I some way to this group. 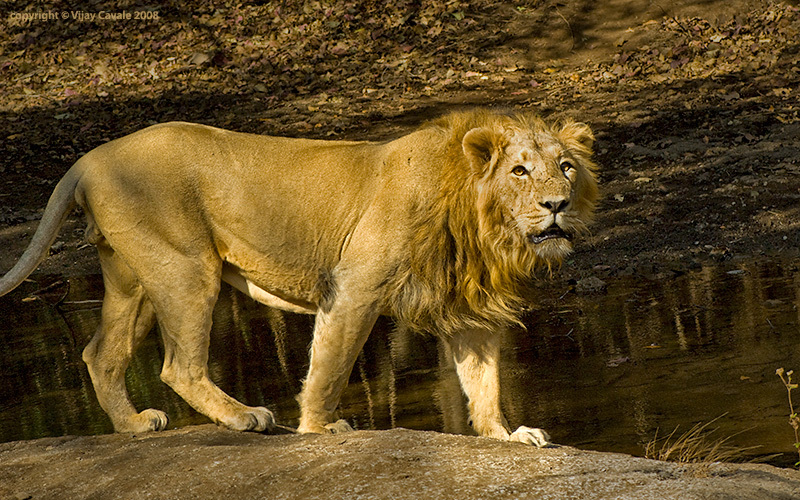 Lions are quite long-lived and can persist undetected for decades. This happened in North Africa, where lions had become almost mythical beasts by the late 1890s, but actually survived in northern Algeria into the late 1950s at a time when Gerry Durrell was founding the zoo in Jersey. I often wonder what Durrell might have done had he known that Barbary lions were still out there in the wild… However, this is not a purely historical issue since in 2016 a lion was caught unexpectedly on a camera trap in Gabon, and later confirmed by DNA evidence to be a survivor of a population thought extinct for 20 years – one of the important Central African relic populations of the ‘northern’ lions Panthera leo leo. This entry was posted in Conservation, P. leo leo on August 21, 2018 by Simon Black. This month sees publication of a historical review by Sara Evans, considering the lion in history, society and culture and, to some extent in our minds as human beings. Sara has made sure that the narrative is dotted with up to date science and comment on the status of lions globally. It makes an interesting start point for further study by a student, without being inaccessible. The insights of conservation professionals and scientists are revealing and the author’s own experiences in the wild places brigs a personal touch to the story. The book is dotted with maps and tables and has a thorough set of colour plates. 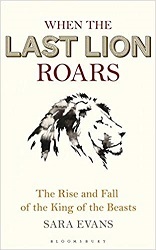 When the Last lion Roars is a gentle but detailed read, allowing wildlife enthusiasts to be introduced or reminded of facts around our often considered most familiar of wild animals. I can imagine that brining the many and varied experiences, research and personal contacts has made the creation of this book a labour of love for the author. But the effort made is timely. If we do not take the message seriously and engage with how on earth we live and accommodate magnificent, dangerous predators like lions, soon enough there will be none to speak of and this book will be just a compelling lesson in history. This entry was posted in Conservation, Cultural Impact, History on June 3, 2018 by Simon Black. In 2016 a camera trap caught the presence of a male lion in Gabon, in the Plateaux Batéké National Park (PBNP) in southeast Gabon – the first seen in the country for 20 years. I t was thought that no free-ranging lions were left in Gabon to the point that lions were listed as locally extinct in Gabon, at a regional workshop held to define the current status and conservation strategies for the lion in West and Central Africa (IUCN 2006). One notable outcome of this consensus on the presence of lions is that the species is also no longer considered by national legislation in Gabon. One question with the Gabon animal was where had it come from? How could this individual – a large, easily recognisable and generally visible species – have appeared in the area. Was it locally present or had it arrived from outside Gabon? Fortunately some hair samples were collected from the vicinity when the camera trap sighting was made and these have been made available to researchers examining genetic origins of lion populations. The subsequent genetic study just recently published by Barnett et al (2018) which has revealed that indeed the animal is related to the historic population of the Batéké region of Gabon. As a long lived species, this animal has been able to survive persecution, but this single male may be the very last individual from that population. The whole episode reminds us of a few stark realities which conservation planners, species specialist groups and legislators need to be kept aware of in their deliberations and decisions. The Precautionary Principle should be applied when considering declarations of extirpation, down-listing or de-categorising of species either locally or globally. Despite all our wisdom, rationality, and understanding of probability, if a species seeks to survive, adapt and find means to do so (that may not make sense to us as humans), it will. Barbary lions survived in Morocco for over twenty years beyond when they were commonly thought extinct. They also survived in Algeria for perhaps 60 years longer than once thought. Now, nearly 100 years later, and with 21st century technology and conservation biologists and wildflife professionals working across Africa, we find lions in Gabon surviving for 20 years unnoticed. Other examples of the species’ survival undetected for more than a decade include hidden populations in Ghana where presence is still under debate (Angelici and Rossi 2017). The real question is – will we use this knowledge to shape our strategies and actions to save a species which has seen perhaps a 50% population decline in the past decade? This entry was posted in Conservation, Extinction on February 9, 2018 by Simon Black. Conservation of wildlife is often a question of trade-offs. In most cases, including the in conservation of large carnivores the trade-off is between human needs and big cat needs. In these cases a point of tolerance by both parties is reached, relating to economics, security, retaliatory action and translocation of dangerous animals. However it has been noted that where tiger conservation has been successful and tiger numbers have increased, there has been a knock-on reduction in leopard presence. Leopards will generally retreat from areas where tigers dominate. This is a classic shift in niche breadth as a function of interspecific social dominance (Morse 1974). Clearly a tiger is an apex predator and will take out (and prey on) leopards. These two big cats differ in the size of prey killed, use of vegetation types, and in activity periods (Seidensticker, 1976). In the absence of the tiger, the leopards can exist on prey which is similar in structure and less abundant than required by tiger. In the presence of tiger, leopards have been shown to shift to areas where the tiger does not occur frequently. Also some evidence suggests that leopards are forced into predation of small livestock (which tigers do not do) when habitats and prey bases are shared (Bhattarai & Kindlmann, 2012), which raises conflict between cats and humans once again. This has implications in areas where leopards themselves are under threat, the amur leopard in the Russian Far East being a good example. 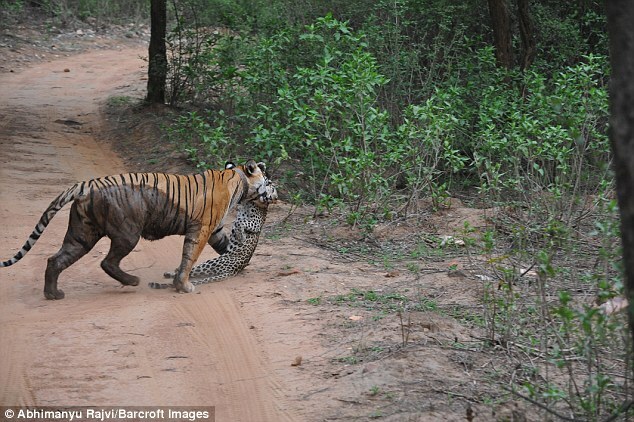 Dramatic footage captures a tiger and a leopard in a brutal battle to the death… just a few feet from shocked tourists. Bhattarai, B. P., & Kindlmann, P. (2012). Interactions between Bengal tiger (Panthera tigris) and leopard (Panthera pardus): implications for their conservation. Biodiversity and conservation, 21(8), 2075-2094. Morse, D. H. (1974) Niche breadth as a function of social dominance. Am. Nat. 108: 818-830. Seidensticker, J. (1976) On the ecological separation between tigers and leopards. Biotropica, 225-234. This entry was posted in Conservation, Ecology on December 12, 2017 by Simon Black. This dramatic, duisturbing photograph sees local people in Bengal trying to dissuade wild elephants with firecrackers and burning balls of tar. Whilst elephants are highly destructive, dangerous, unpredictable, this type of conflict is unlikely to be productive. An adult elephant will not be stopped, even by elephant proof fencing. As human land-use encroaches on traditional habitats and pathways of wild animals these conflict increase in frequency. Deterrents such as fencing, chilli ropes have an effect, but also the education of local people on how to respond to elephant encroachment. A further challenge is to get officials, developers and local people to understand how to reduce the disruption of habitats by building in unsuitable areas. © Biplab Hazra/Sanctuary Asia/Facebook The picture was taken by Biplab Hazra, a photographer from West Bengal. Conflict causes escalation of consequences, for people, for wildlife or both. Elsewhere in Assam, efforts by conservationists to give early warning to local crop producers when elephant herds are drawing near allows families and communities to remove crops from fields before the mammals encroach on the agricultural landscape. Whilst this arrangement might not be optimal, it is an example of the type of tolerance and human cooperation which reduces conflict and removes incentives of elephants to visit landscapes which would otherwise be attractive for foraging. Other challenges occur with big cats, which can easily pass unnoticed in urban landscapes let alone villages and agricultural areas. this means living with a number of challenges discussed elsewhere in this blog. 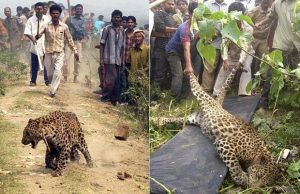 Local people chase a leopard in Guwahati, Assam, 2009 (northeast India). The animal was tranquilized by a local wildlife official and relocated. However three people in the village had already been mauled by the big cat. This entry was posted in Conservation, Ecology on November 15, 2017 by Simon Black. 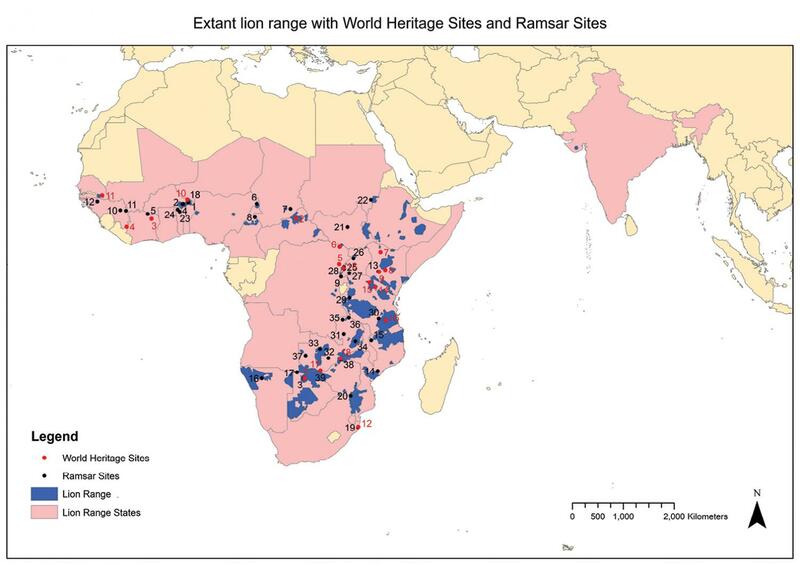 Lions survive in 25 countries, but the habitats are highly fragmented, even in the strongholds of south eastern Africa. The ecology and breeding biology of the species means that discrete ranges are unlikely to be a long term solution to maintain numbers. This most likely involves seeking solutions where the species comes into contact with human communities and modified habitats. Biology is ‘necessary, but not sufficient‘, to inform and deliver conservation. Other measures and resources need to be drawn upon if range-wide solutions can be developed. A recent study suggests that a range of measures is necessary to achieve the type of sustainable outcomes needed to support the species. In addition t this, since lions themselves present threat to other endangered species such as cheetahs, wider systemic understanding of lion habitats and ecology is needed. This entry was posted in Conservation on October 23, 2017 by Simon Black. The lions which are direct descendents from the captive collection of the Sultans and later Kings of Morocco are all in zoos. 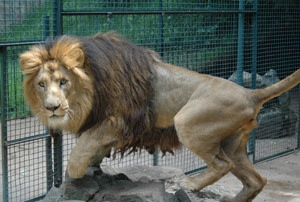 There is a healthy group of lions in Temara Zoo in Rabat, plus even more related individuals spread across a dozebn or so zoos across Europe, with around 100 animals in captivity overall. Ten years ago there were about 80 of these lions and many of those were beyond breeding age, or had already contributed significantly. Just around then, old and alone, the last female with genetic representation from founder animal 7 died and with her 1/12th of the genetic basis of the captive population. Unfortunately until the studbook was developed from detailed examination of handwritten zoo records and a sweep of various databases, websites and personal contacts acrtoss European zoos the precariousness of the captive population was unknown. However since then a number of zoos have joined the programe to breed the animals and there have been successful transfers that have made the population a lot more healthier. When the studbook was devised it was hoped that a reinvigorated programme would give the zoo population another 10-15 years breathing space as a viable captive group. However a few animals are underutilised – males needing suitable females – and some breeding pairings have been completely unsuccessful. Greater cooperation is needed between zoos to maximise the strenght of the whole population, not just the small groups held in each zoo exhibit. The first ten years since the revival of the breeding program has since passed. Concerted effort and active partnership is needed now to get inactive males and females together to develop breeding pairs. Yamaguchi N, Haddane B. (2002). 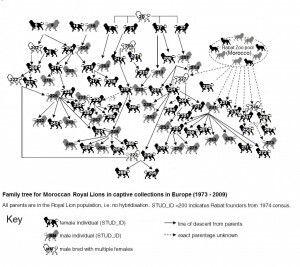 The North African Barbary lion and the Atlas Lion Project. International Zoo News 49: 465-481. This entry was posted in Conservation, History, Zoo Research on September 30, 2017 by Simon Black.